Beth is here for a visit, the occasion being the Mid-Atlantic Quilt Festival. Tomorrow we are heading to Raleigh to do some super duper shopping at Suzanna's and meet up with some blog friends. FUN ahead! Yesterday and today we checking out the quilt show and sale. Serious damage was done to our checkbooks. yup. 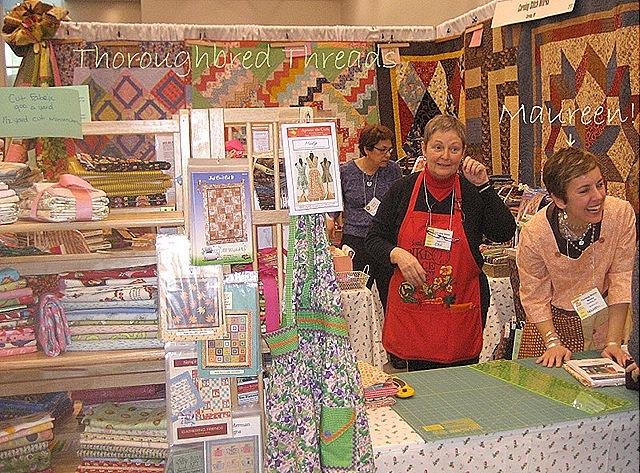 One of our favorite vendors is Maureen and her shop from Corning, NY, Thoroughbred Threads. Beth and I both whipped out the checkbook here. Maureen never disappoints with her selection. The quilts and artwork on display was exquisite. 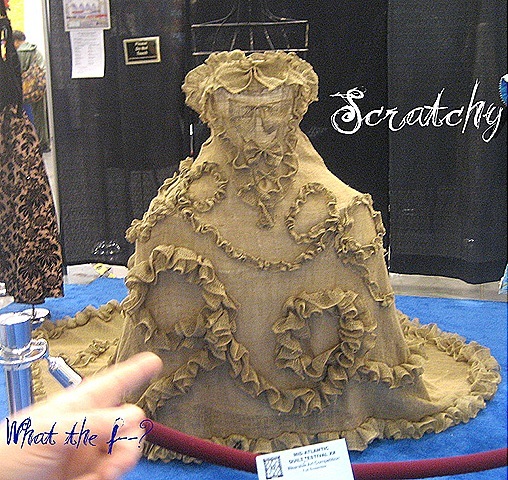 This burlap gown was just over the top! Off to bed, it's early to rise tomorrow so that we can be in Raleigh for a long day of shopping. Woohoo!! Can’t wait to see you guys! Thanks for the pics! We love seeing what you find! 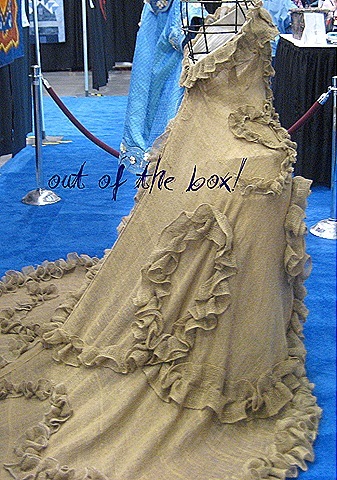 I’ve never see such an exquisite burlap creation – must have been hard on the fingers making it! I’m trying to find some fine, soft burlap that can be washed without falling apart – know of anything available by chance? Perhaps I’m dreaming. Just wish we could get the old French hemp/linen type fabrics here – they’re available from importers but the prices are sky high online! I’m hoping to see you today at SuzAnna’s – sorry it’s wet! You really should have tried on that dress. I’m just sayin!! !